3Dfury can output in both Digital and Analog Video/Audio simultaneously ! Therefor acting as an advanced digital/analog splitter. Dual projectors setup using two 3Dfury modules and passive glasses. Up to 720p240 in dual projectors setup ! Output: Digital HDMI / DVI-D and/or VGA FEMALE output connector, 10 bit analog resolution. Supports DTV resolutions up to 1080p @ 72Hz or 720p/1080i @ 120Hz with 36-bit color depth. Passive glasses for Dual projectors setup. 3Dfury Glasses with emitter (60/144hz) : All controls like Duty cycle, Delay, Invert, Presets are on the glasses itself, you can stay on the couch and tune up everything till perfection. Settings are applied directly on the glasses. Control Delay directly on the glasses. Control Duty Cycle directly on the glasses. Invert button directly on the glasses. Loaded with presets selectable on the glasses. Full Sharpness and Brightness control. 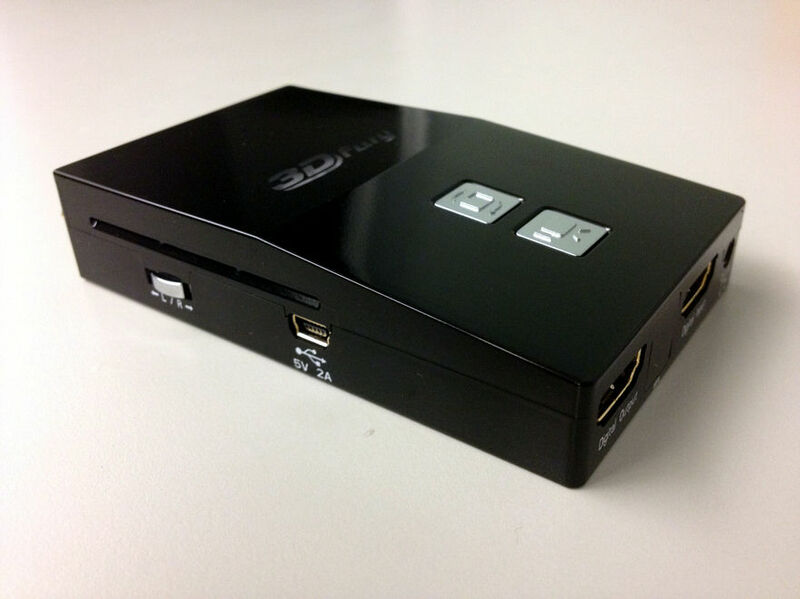 Play 3D movies, games, satellite/cable, and internet videos on any HDTV/Projector/Dual Projector or Monitor! 3Dfury allows you to view 3D content from your PS3, Blu-ray player, satellite/cable or internet on all standard 50/60Hz or 100/120Hz HD displays with either Digital or Analog inputs or both at the same time ! 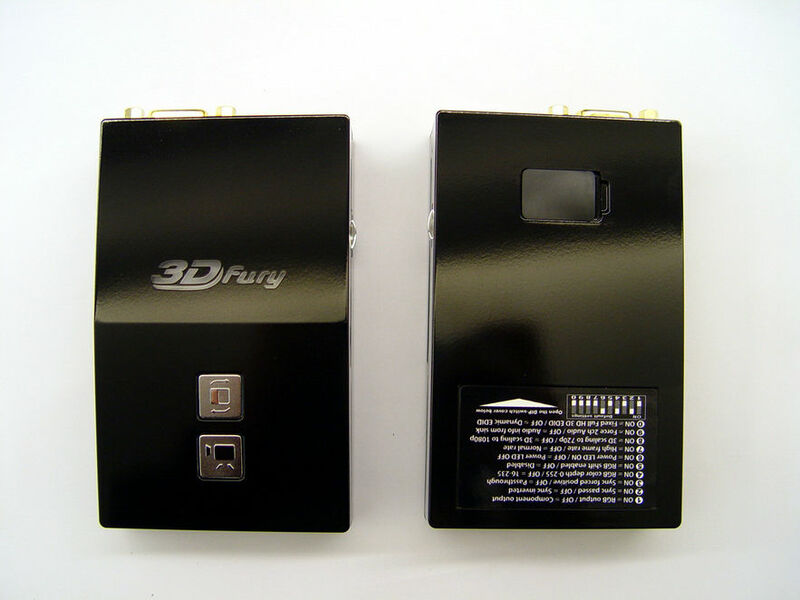 If your HDTV or projector can play regular non-3D games and Blu-ray movies then the 3Dfury will work for you! 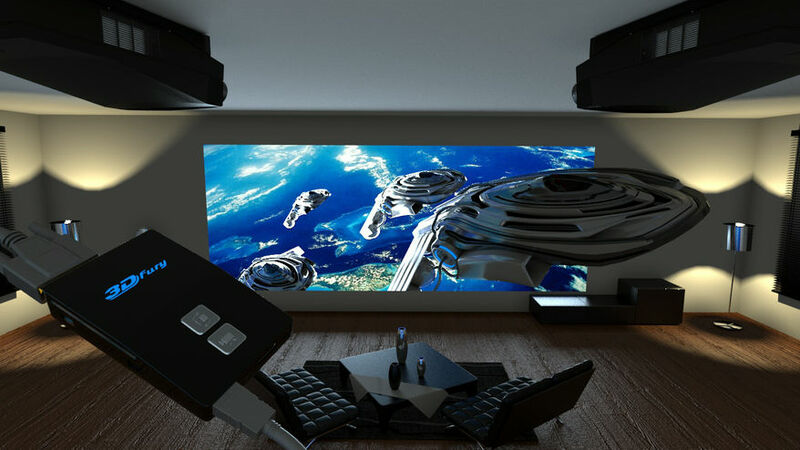 It turns your existing HDTV or projector into a 3D home theater! 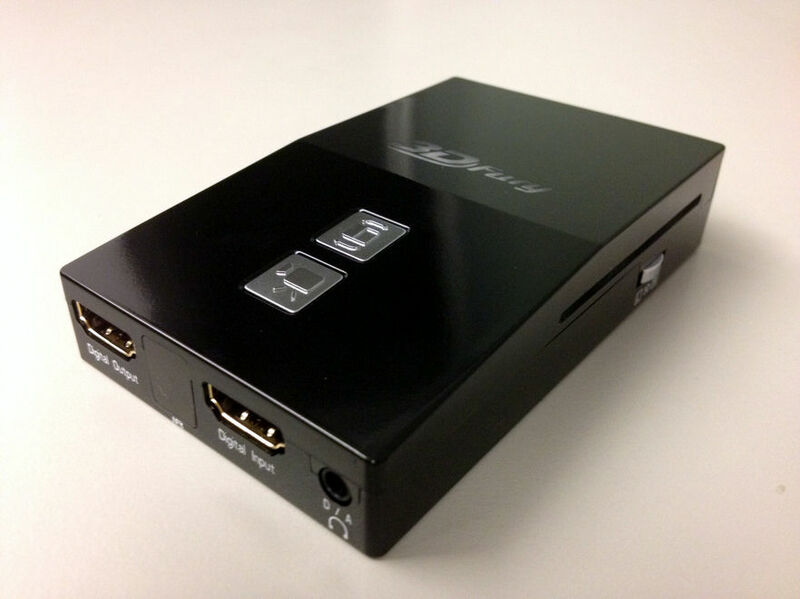 If your HDTV or projector cannot play HDMI content because it lacks of a HDMI input, 3Dfury can still turn it into a 3D home theater, thanx to embedded HDMI converter based on HDfury technology. Upgrade to 3D and HDMI at a fraction of the cost of buying a new display! The 3Dfury supports every 3D signal type in existence today including frame-packing, side-by-side, top-bottom. It is firmware updatable so that new features can be added in the future as needed! Start watching Blu-ray movies like Tron: Legacy 3D and Despicable Me 3D as well as sports and movies on ESPN 3D and SKY 3D and see what you’ve been missing! 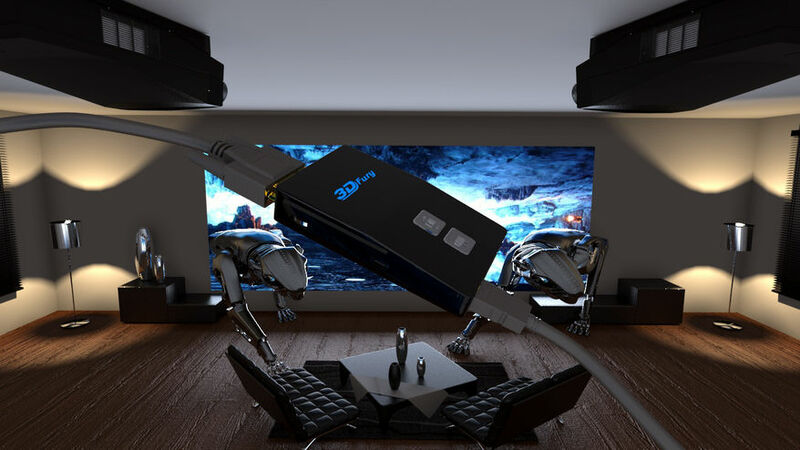 In addition to supporting all standard 50/60Hz displays in either analog or digital (HDMI, DVI-D, RGBHV, component), the 3Dfury also supports any 100/120hz 3D Ready DLP-Link projector by brands like Optoma, Benq, Viewsonic, etc. How difficult is it to set up? A few dip switchs on the 3Dfury must be set once depending on whether your TV is a 50/60Hz or 100/120Hz model or if it takes Digital DVI-D/HDMI or either RGBHV or component as input. No other setup is required. 2D video just passes through the 3Dfury without any modifications (except for advanced double/triple frame mode). Just connect the 3Dfury between the source and the TV/projector. That’s it! PS3 users need to make sure to have the latest firmware installed and go to Settings -> Display settings -> Video Output and select “automatic” so that 3D output is enabled. After that you just launch the game and that’s it – 3Dfury will take care of rest. * Some sources may not cause the 3Dfury to autoswitch to the right 3D mode as the information is missing. In this case you can force 3Dfury to the right 3D mode. Which projectors and TVs are supported? Any standard 50/60Hz or 100/120Hz displays will work with 3Dfury. 3Dfury is the world first solution that work with either Digital (DVI-D/HDMI) or Analog (RGBHV/component) displays as well as ultimate Dual Projectors setup ! Which 3D glasses are right for me? Passive glasses are only suitable for Dual projectors setup. For any others setup, Active Shutter glasses are requiered. We recommend the Radio Frequency (RF) Active Shutter glasses as they are universal and work with all display types. If you have a DLP HDTV/projector that supports 100Hz or 120Hz, the DLP-Link Active Shutter glasses can also be used. OK: DLP-Link Active Shutter glasses: For use with 100/120Hz DLP HDTVs/projectors only. They do not work with standard 50/60Hz HDTVs/projectors or non DLP displays. No emitter is required. The glasses link to the DLP projector without any sort of special emitter or 3rd party transmission device. Not adjustable/configurable. Note that DLP Link glasses only work with DLP displays so if you upgrade or change your display to a non-DLP model, these glasses will no longer work. For this reason we recommend RF glasses. NOT RECOMMENDED: Infrared (IR) Active Shutter glasses: For use with all HDTVs/projectors (50/60Hz or 120Hz). One emitter is required and can control multiple IR glasses. Infrared is directional and is therefore affected by line-of-sight interference (the IR glasses must at all times be able to ‘see’ the emitter). Standing up, turning your head, or just leaning forward to pick up your drink is often enough to cause the IR sync to be lost. Infrared can also be affected by IR remote controls, florescent lights and sunlight. We do not recommend IR glasses in most situations for these reasons. BEST: Radio Frequency (RF) Active Shutter glasses: For use with all HDTVs/projectors (50/60Hz or 100/120Hz). One RF emitter is required and can control multiple RF glasses. Unlike IR glasses they are completely immune to interference. These are universal glasses that work on any manufacturer’s 3D TV as well as our 3D converters. We highly recommend that these glasses be used regardless of the type of TV or converter you purchase. They are completely adjustable/configurable. To ensure highest possible compatibility please look for glasses with adjustable delay, offset, duty_cycle and sync inverter. Our 3D glasses offer all possible configurations including presets directly on the Glasses themself so you can tune them up perfectly without having to stand up from the couch. We designed and offer the worldwide first glasses that can operate from 60 to 144hz. Can the 3Dfury be used for 3D Games? Yes. 3Dfury supports the 3D frame-packing standard used by 3D games as well as any other 3D formats. Can the 3Dfury be used for 3D Blu-ray movies? Yes. 3Dfury supports the 3D frame-packing standard used by 3D movies as well as any other 3D formats. Can the 3Dfury be used for 3D satellite/cable or 3D internet streaming content? Yes. The 3Dfury supports the 3D side-by-side and top-and-bottom standards as well as any other 3D formats. What 3D formats does the 3Dfury support? What output resolution does the 3Dfury support with 3D content? How do I know if my display supports 50/60Hz or 100/120Hz? All displays support 50/60Hz. Some displays support 100/120Hz. Try both! My HD display is from Europe/UK/Australia where we use a 50Hz refresh rate. Will it work? Yes, as all HD displays that support 50Hz also support 60Hz. .
What happens when I watch regular 2D content? The 3Dfury simply passes the 2D video signal through unaltered (except in double/triple frame mode where it can output 1080p48 and 1080p72 from 24hz material). It’s as if the 3Dfury is not even there. The 2D video signal is not altered in anyway. The 3Dfury supports all standard 2D video resolutions including (but not limited to) NTSC 480i/p, PAL 576i/p, HDTV 720p/1080i/1080p. I use an HDMI converter with my display. Does the 3Dfury work with HDMI converters? However 3Dfury also include its own converter so you won’t need any additional converter for analog output. Also 3Dfury can output both Analog and Digital video/audio signal simultaneously ! What version of HDMI does the 3Dfury work with? Do I need HDMI 1.3/1.4a? Does it matter? It does not matter. 3Dfury works with any version of HDMI from 1.0 and up. That said, if you find you’re having problems it’s best to simplify and hook up the 3D source directly to 3Dfury first as that will work. 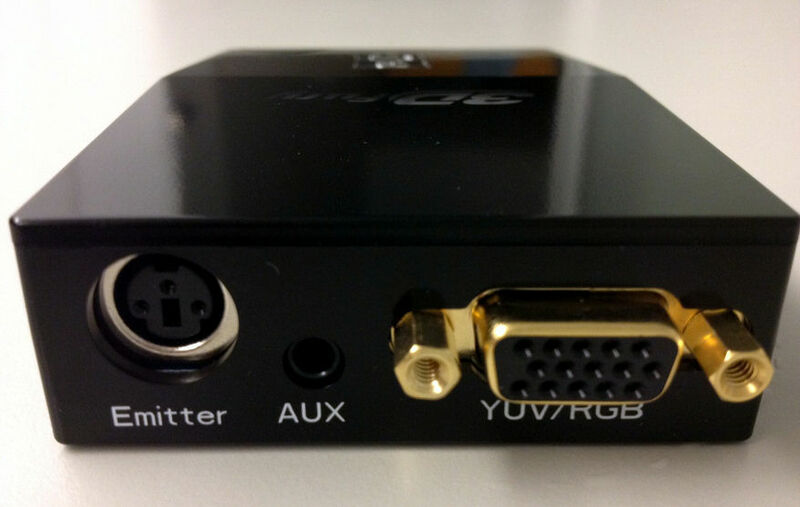 Some older HDMI receivers or switchers may block 3D recognition causing problems, while others may work fine. Do I need to set anything special in my 3D source device to set resolution correctly? No. The 3Dfury always outputs 3D content at 720p/60, 720p72, 720p96, 720p/120, 720p144. This is to maximize compatibility throughout all displays in the market. There is no need to set the 3D source to any specific resolution, the 3Dfury will take care of it and scale if needed. More output mode are currently being implemented and should be available on first shipping date. Is there any latency (delay) introduced to the signal? Less than one frame of latency per second is added to the signal which is not at all noticeable in games. What is the USB port for? To supply power from any USB port available if required (such as a PS3 USB port) and for firmware upgrades when new (additional) functions and enhancements are offered. What about long HDMI cable runs? Can I expect issues? 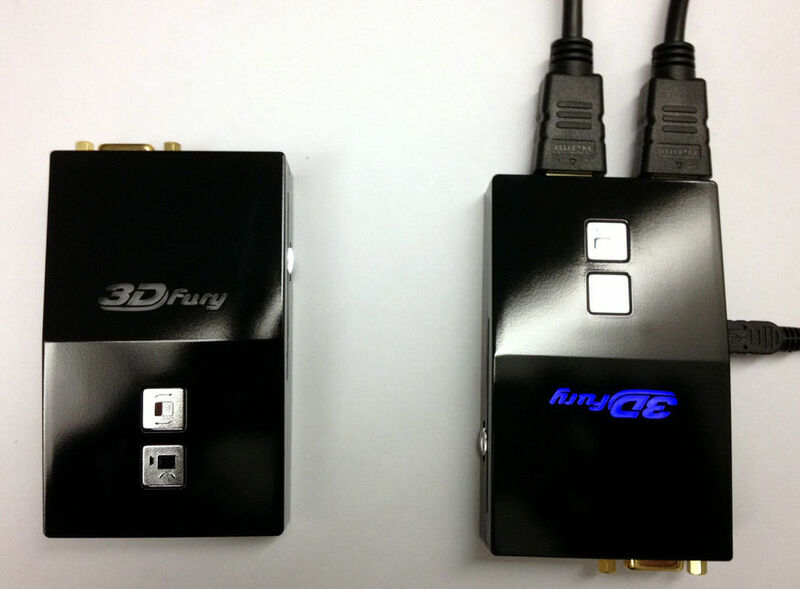 3Dfury acts as an HDMI repeater device. So having a 3Dfury in the path will amplify and recover the signal. You should not need any passive (or active) HDMI amplifiers, especially if you put 3Dfury in the middle of your cable run. If you previously had to use an amplifier, the 3Dfury can most likely take its place. The 3Dfury has been used with 50 foot (and longer) HDMI cables without issues. What sort of 3D formats exist? Frame-packing: Used by Blu-ray movies and games. Side-by-side: Used by cable/satellite/internet mostly for documentaries. Top-and-bottom: Used by cable/satellite/internet mostly for movies and sports. What is “frame locking”? I hear some people with digital displays have “frame locking” issues. The frame locking issue is a result of less than ideal engineering in some digital TVs/projectors. It is an undocumented reality in the design of some displays where the actual visible frame rate at the panel of the display or at the “lamp” of a projector is in fact deviating from the intended 60Hz (or 50Hz). The reason is that the display cannot keep up with the decoding of the video stream or the additional video processing the display is trying to do is too demanding. The result is the display decides to drop a frame here and there just to keep up. This results in an actual refresh rate of something less than 60Hz (e.g. 59.2Hz, 58Hz). It can be a completely dynamic phenomenon, depending on the amount of action in the scene. Since glasses are fixed at the real frame rate, there can be a slow drift and glasses can loose a “lock” to the actual visible video. Eyes cannot see this change in 2D but obviously for 3D it becomes visible. How can I know if my digital display will have a “frame locking issue”? There’s unfortunately no easy way to tell unless you talk to other owners of the same display or try it for yourself. There’s no comprehensive list of which digital displays suffer from it (see next question). The good news is that it’s extremely rare. With hundreds of units in the field there have been very few complaints. Some displays can be fixed by making display setting changes (ex: switching to “game” mode) which will drop unnecessary processing from the display as is required for the content to sync properly. Is there any way to use the 3Dfury with passive glasses (glasses without batteries)? No. Active shutter glasses are required that are sync’ed to the 3Dfury*. *Except for Dual projectors setup where passive glasses are requiered. I have active shutter glasses that came with my TV but the emitter is built into my TV. Is there an way to use these glasses with 3Dfury? No. An emitter that plugs into the 3Dfury is required such that the glasses can be kept in sync with the image. Can I use third party glasses that include an emitter? Yes. Any external 3rd party glasses that include an emitter will work with the 3Dfury as long as the emitter has the 3-pin standard mini-din connector. Does DLP glasses work with 3Dfury ? Yes. As long as the projector supports dlp-link to drive the glasses. How are the new lossless audio formats via HDMI input handled ? E.g. DTS-HD/MA and DD/E-AC3 : Are they stripped down to DTS core or Dolby Digital respectively to fit the requirements of the S/PDIF standard ? Lossless audio is transmit through HDMI output only. 3Dfury does not compress or otherwise create loss to the incoming audio. Only stereo and 5.1 sound can be output via SPDIF output and analog output. Does 3Dfury allow to extract the sync for 3D glasses out of digital HDMI/DVI 100/120Hz signal, not a super frame, not a side by side signal. Can the 3Dfury provide the sync signal for attached 3D glasses when its feed with a digital HDMI/DVI 100/120 Hz signal ? If yes can it be feeded with any resolution and refresh rate within its bandwith/capabilities ? Yes 3Dfury have an option to output sync for any content. 3Dfury syncronize to the vertical sync signal and create the 3Dsync out of it. What is Ghosting/Crosstalk or Flicker issue that people oftenly refer to when speaking about 3D and shutter glasses ? The biggest drawback of Shutterglasses is Crosstalk. It can be due to the persistance of tube (If you are using a CRT display) or the inability of the LC-panels to block the light entirely, or to sync-errors and other factors, one could see “Ghosting”, “Ghostimages” sometimes. The right eyes sees some residue of the image dedicated to the left eye and vice versa. Another common scapegoat for inadequate hardware, software, and lack of stereo training is flicker, which is most noticeable in standard fequency (e.g. 60 Hz) field sequential systems. It varies with many factors, especially screen brightness, screen size and room illumination. The image may still flicker even at 120 Hz screen refresh if the image is not updated in the proper way. Decreasing the level of ambient illumination in the room can reduce the room flicker to imperceptible levels. Reducing screen luminosity with brightness and contrast controls will reduce image flicker to low or imperceptible levels. Anyway, we have engineered 3Dfury and our Emitter/Glasses to the highest possible standard thus giving amazing results with nearly none of just a few user custom setup steps. What movies & games are available in 3D? What Blu-ray players support 3D? The unit works and does so extremely well – there is no comparison to the VHD that it replaced. – Alex. “Actually i was “shocked” when the picture was first displayed with a substantial increase in image quality compared to my HDFury3, i didn’t really expect to see a difference in the picture quality, i was wrong, i cannot believe that old sets like mine are still getting better over the years through the new fury coming out, it have superb color and more likely the sharpest image i ever saw, simply out-standing.” - Komeus T.
“Your HDfury4 device is a godsend! I first though i would have to do many operations in order to get it working for my setup, but this thing just blown my eyes within a minute, mouth open and WOW ! the picture quality is insane ! !” - Max D.